AUDIOTRAK is recognized as a company with multi-year experience in the field of digital audio solutions. PRODIGY CUBE created based on AUDIOTRAK’s own technology accomplishes the best computer-based multimedia audio system, supporting compatibility with Apple Mac as well as Windows, the USB-based powerful and high-quality sound dual headphone amp, the best condenser-applied analog RCA output port, and the high-quality transformer-applied optical and coaxial digital output for the best-quality audio solution. High-quality microphone amp is fully prevented from interfering with the analog output port to boost its utilities for multimedia. TENOR chipset, the 24bit / 96㎑ USB Audio controller, is mounted as well as Wolfson’s high-performance D/A converter. 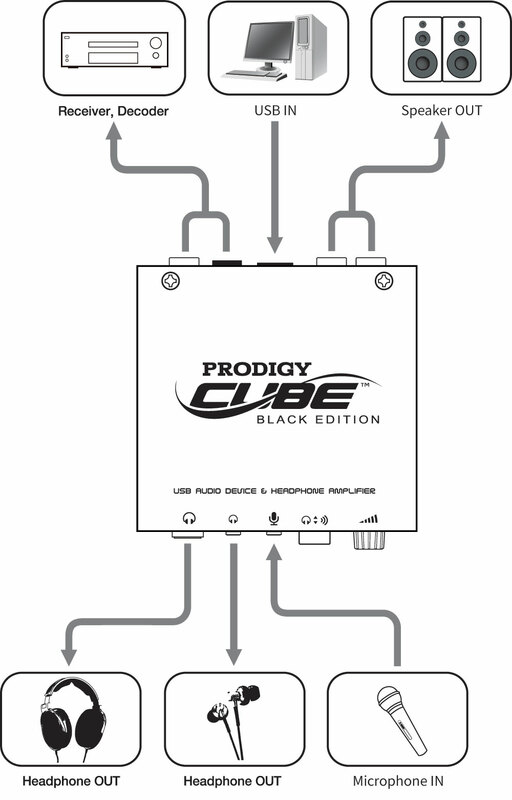 PRODIGY CUBE is powered enough only by USB connection and is the best USB audio solution requiring no driver installation. Dual headphone output does not require the conversion gender by supporting both stereo-mini and stereo-phone standards, performs well enough even with 150 Ω headphone, and offers clear and high-resolution sound through the D/A converter and the high-performance OPAMP. The protection circuit for a low-impedance earphone is installed on an output port of the stereo-mini standard headphone to optimize various headphones for PRODIGY CUBE. 24bit/96㎑ Bit-Perfect lossless PCM digital output is supported. 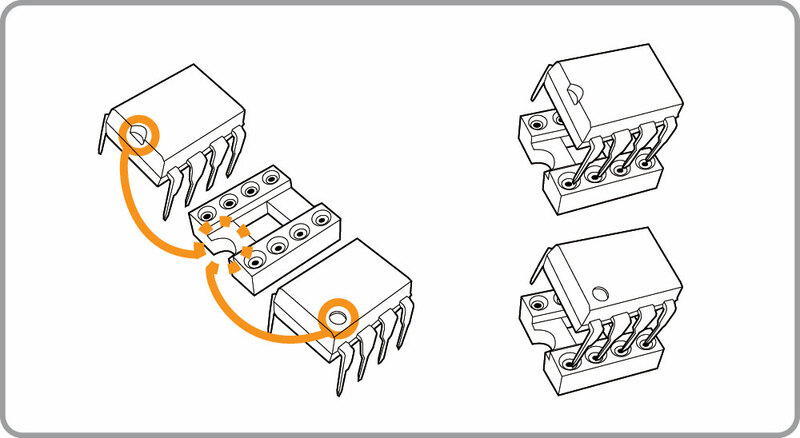 Both Optical/Coaxial ports are istalled for connection with various digital devices. AC3(Dolby Digital)/DTS Pass-Through realizes 5.1 channel surround system by connecting with a receiver and a decoder-embedded home theater speaker. SamYoung's AHS Series Electrolytic Capacitors are used for all electrolytic condensers on the circuitry to secure stability of the circuit and high-quality sound output. SamYoung LL(Low Leakage) Series is used for the analog output L and the R-coupling circuit. SamYoung's Low-ESR Electrolytic Capacitor is mounted for OPAMP power supply port. With HI-Fi audio sound output provided, the high-performance microphone amp is mounted for PC voice chatting, internet phone, and internet music broadcasting.The high-performance microphone amp is completely separated from the output port to prevent interference between input and output of sound for high-quality input and output of sound. ※The Pass-through Digital output is available to Windows 8, Vista (SP1) and MAC OS-X only. Headphone output ports (6.3㎜ stereo-phone / 3.5㎜ stereo-mini) connect with a headphone and an earphone. The protection circuit for a low-impedance earphone is installed on the stereo-mini port to optimize co㎜on general low-impedance earphones for PRODIGY CUBE. ※Caution : Minimize the volume during connection. Connection with devices except an earphone and a headphone may cause failures. The highly-sensitive microphone amp is used for recording voice and broadcasting on the internet and is completely separated from the analog output port to prevent interference between input and output of sound. Output selector switches headphone output and line output. The headphone output is selected as default, and is switched to the line output by pressing the output selector. Levels of both headphone output and line output are controlled. The green STAN-BY LED indicates power ON/OFF of PRODIGY CUBE. The yellow USB Link LED indicates that your computer recognizes PRODIGY CUBE as a normal USB AUDIO device. Line output port connects with an integrated amp, a power amp, and an amp-embedded speaker. USB Connection Port is connected to USB port of your computer for stable power supply. ※Caution : Connect the PRODIGY CUBE directly to your computer for wide bandwidth of 24bit/96㎑ and stable power supply. Digital output port with 24bit/96㎑ digital output capability connects a receiver and a decoder. No driver installation is required. 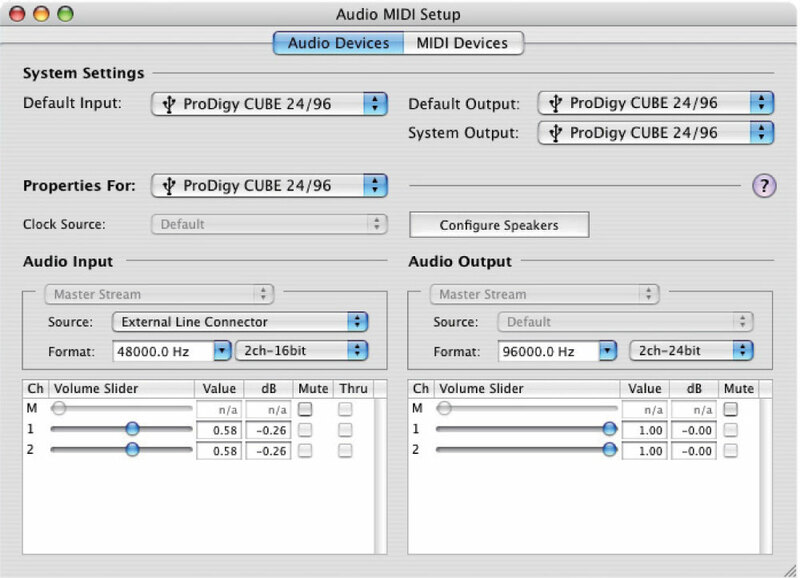 PRODIGY CUBE is automatically recognized as a USB AUDIO device shortly after USB-connecting with your computer. Then you can enjoy PRODIGY CUBE directly. System Configuration → In Sound, PRODIGY CUBE is registered automatically. More detailed input/output set-up can be executed by using MIDI Set-Up as follows. Select External Line Connector in Audio Input for using microphone input. Select External Line S/PDIF and for recording Mac OS X sounds. No driver installation is required. 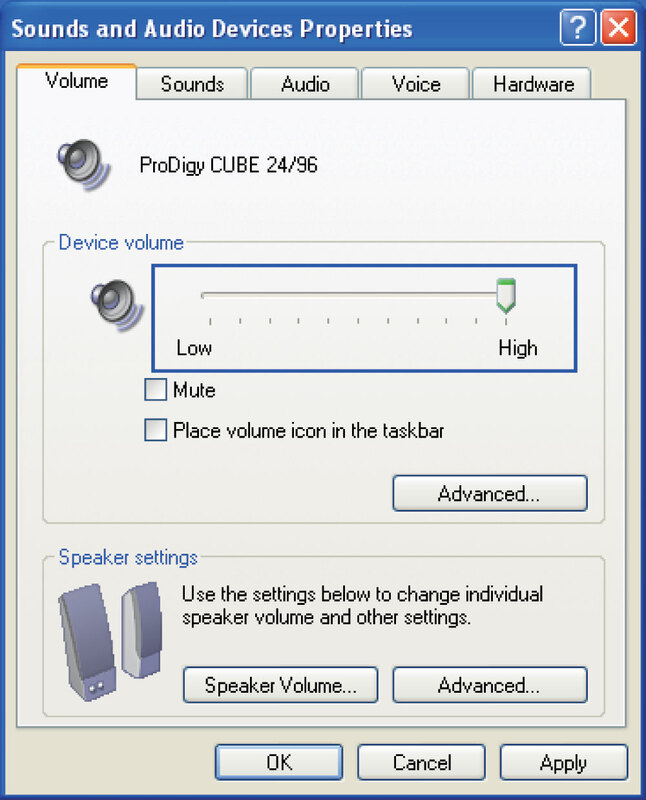 PRODIGY CUBE is automatically recognized as a USB AUDIO device shortly after USB-connecting with your computer. Then you can enjoy PRODIGY CUBE directly. 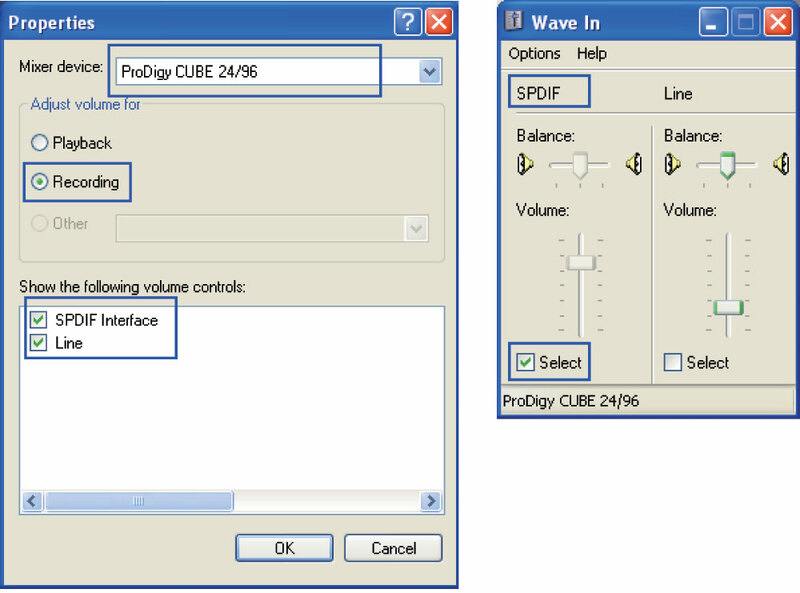 When PRODIGY CUBE is USB-connected to your computer, Windows basic USB AUDIO driver is automatically installed, showing `New Hardware Detected` message. 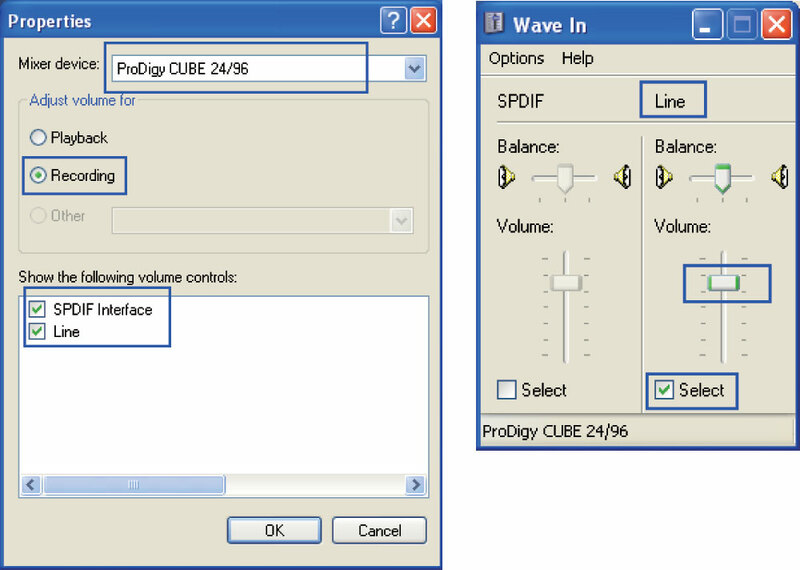 Control Panel→Sound and Audio Device→In Audio, PRODIGY CUBE is registered automatically. Output volume is about 50% on Windows as default. 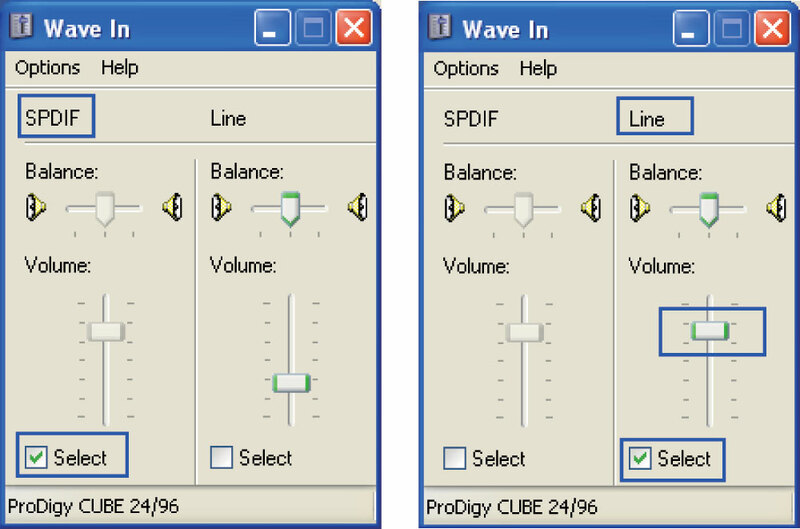 For higher-quality sound, you are reco㎜ended to use the analog volume control of PRODIGY CUBE with the volume of your computer maximized. Windows sounds can be recorded. 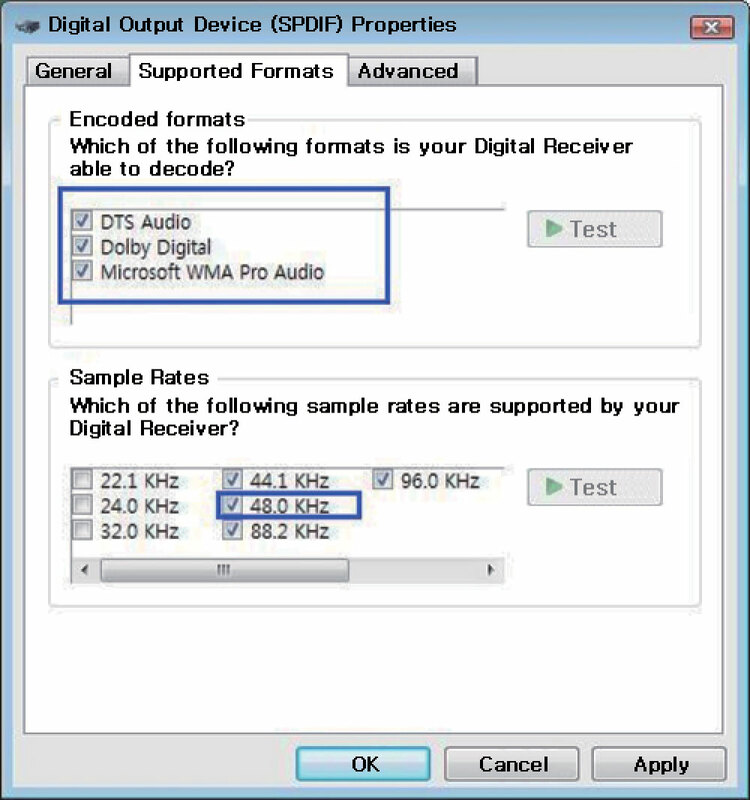 Click the Volume icon on the system tray in the right of the Windows task bar to call the Windows Recording Mixer, and then select S / PDIF Interface as follows. For using microphone input, click the Volume icon on the system tray in the right of the Windows task bar to call the Windows Recording Mixer, and then select the Line as follows to control appropriate volume (refer to Tip 1). TIP 1) Monitoring function for microphone input is not supported. For volume control, check appropriate volume while recording with software such as Window Recorder. TIP 2) Stereo mixer function is not supported. In case PRODIGY CUBE is used for internet music broadcasting, open Windows Mixer window as follows, and then select S/PDIF interface for playback or select Line for microphone input. Replaceable OPAMP allows a user to enjoy user’s own sound taste by replacing OPAMP with another. You must open the case to replace OPAMP. As shown below, OPAMP should be aligned with the groove of the socket. Regular OPAMP must be used. ※ Note: You must pay close attention to the direction of the OPAMP when you exchange it. Particularly, in case of a product damage or functional problem due to wrong installation of the OPAMP, we do not guarantee service free of charge during warranty period so please be cautious for installation.